Python Software Foundation News: PSF Python Job Board relaunched ! 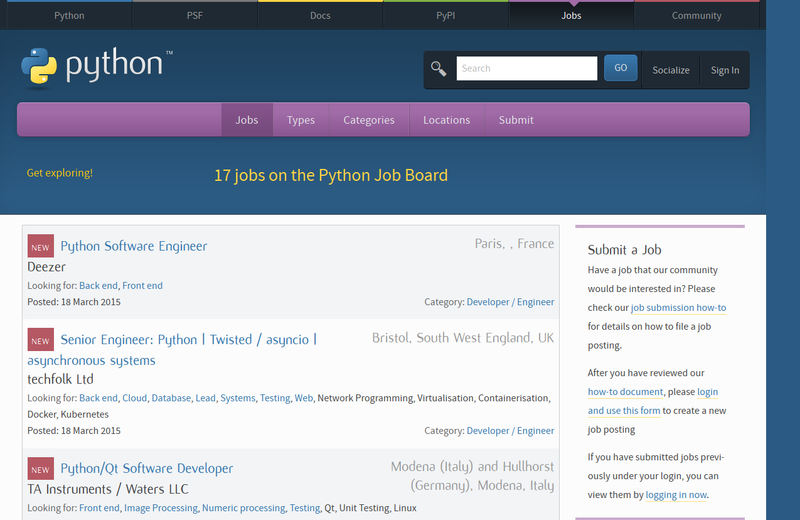 We are happy to announce that we have successfully relaunched the PSF Python Job Board. After almost one year of development and lots of work by our volunteers and contractors, we are now live with the new Python job board system. The new system is fully integrated into the python.org website. Job submitters can create an account on the system, log in and directly submit their job posting for approval by the PSF Job Board Team. The team can then review the postings, check them against our submission criteria, possibly fixing some formatting, and then approve or reject the postings directly through a web interface. No more sending dozens of emails back and forth to get the job template fixed and adding jobs to the website by hand. Plus everyone I forgot in this list (sorry; mail me and I'll have you added). We'd also like to thank to Martin Thomas and Chris Withers, who each ran the Python Job Board for several years by email before the job board team was set up. If you want to submit a job, please visit the how-to page which describes the process. Submissions are free, but we'd appreciate a thank you in form of a donation to the PSF. You can click through the jobs on the jobs listing or subscribe to the RSS feed we have for the listings. Please note that we do not post CVs on the site. You will have to contact the companies directly. Good luck with finding a new job ! As with every new system, there are still some bugs left. If you find something, please report it on the Github issue tracker. If you have questions, please write to jobs@python.org.